What do nearly 65 retired or semi-retired San Diego admirals, generals, captains of industry, an ambassador, educators, a newspaper chief executive officer, a San Diego County Sheriff, doctors and lawyers and one of the original astronauts have in common? They are all members of an original San Diego institution known as Q.E.D. which was derived from the Latin phrase, quad erat demonstratum ("which was to be demonstrated") and now stands for Quandaries, Explorations and Decisions. The members wield considerable influence among their constituencies and are active participants in a monthly forum for thought provoking presentations on almost any subject critical to the forward progress of San Diego County and, in some cases, the nation. Q.E.D. 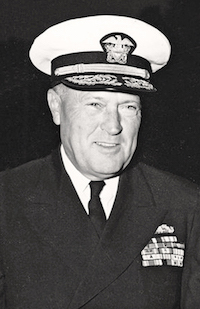 was founded in 1963 by the late Vice Admiral Wilder D. Baker, USN (namesake of the San Diego Admiral Baker Field and Golf Course), and Burnett Walker, a founder and chief executive officer of Smith Barney, who was a leading figure in international banking for more than 40 years. There are only two Chapters, the other being in Norfolk, Virginia. • To promote harmony and fellowship among members. The organization's members can vote on policy resolutions on “problems of timely significance” but refrain from endorsing local, state and national political candidates or platforms.